Conway, Ark. 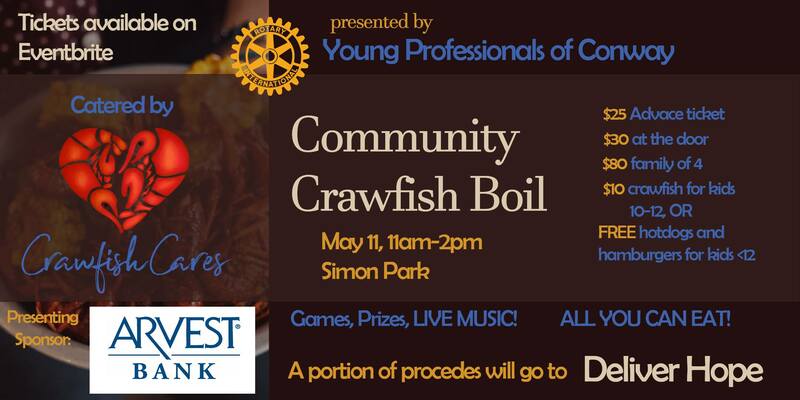 (Feb. 04, 2019) – The Young Professionals of Conway (YPC) will be hosting their 2nd Annual Crawfish Boil Jubilee on Saturday, May 11th from 11 a.m. to 2 p.m. at Simon Park. A portion of the funds raised from the event will be given to Deliver Hope, a local nonprofit organization that helps mentor and lead at-risk youths of the Conway area by selling tickets to the all you can eat crawfish boil. YPC will be partnering with Crawfish Cares, local business that serves the Conway and Little Rock metro area each year with crawfish to provide the food. Special guest will be the Mayor of Conway, Bart Castleberry. “This event will serve as our big kick-off event for the year. We want this year to be big not only for our organization but also for the Conway community. 2019 is our year to connect engage, and most importantly fellowship with our community like never before” stated Brandon Hardy, Community Outreach Liaison. Tickets are now on sale, $25 dollars for advance tickets which will be sold until March 29 at midnight, $30 tickets at the event as well as $80 for a family of 4. Tickets for kids ages 10-12, will be $10 and hot dogs and hamburgers will be available. Tickets can be purchased from the YPC website or from the YPC Facebook Page. We will be announcing sponsors on our Facebook and will be giving away tickets leading up to the event.